Today there are lot of recipes which use millets for pongal. 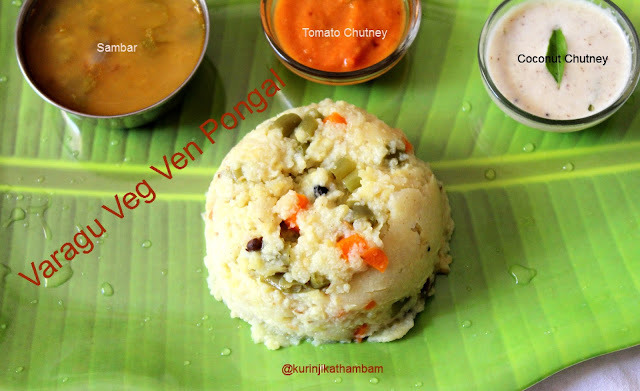 In this recipe I added vegetables also along with varagu (Kodo Millet) vegetable pongal recipe. 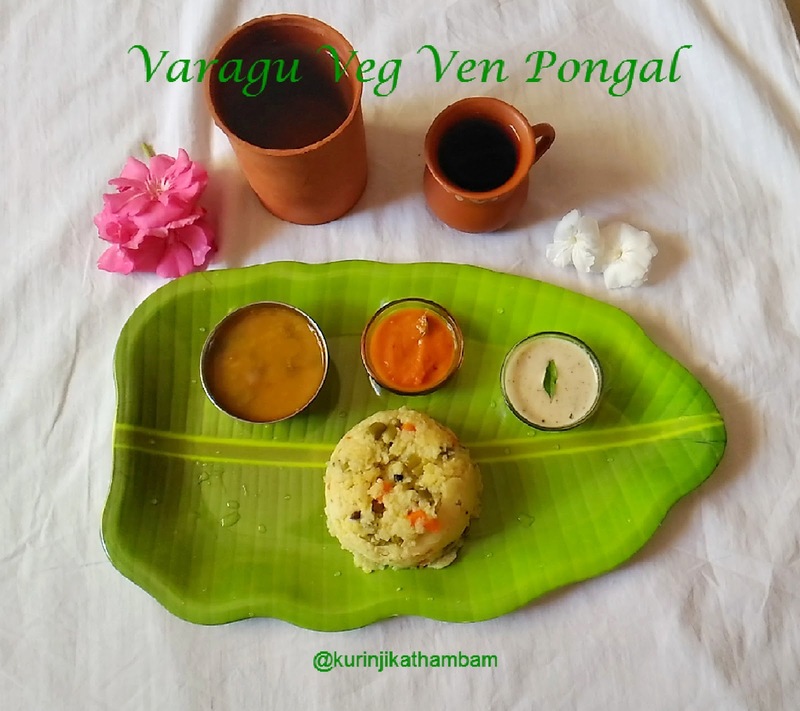 The vegetables adds more flavour to the pongal and is is also healthy too. 1. Dry roast the dal till the nice aroma comes out. Allow it to cool down completely. 2. Dry roast the rice for 2 mins or get really hot. Allow it to cool down completely. 3. Mix the rice and dal together and wash them twice. Then soak it in 2 cups of water for 10 to 15 mins. 4. Meanwhile, dry roast the pepper and cumin seeds together till the nice aroma comes out. 5. In a pressure cooker, add the rice, moong dal mixture with soaked water. 6. Then add the roasted pepper and cumin seeds, curry leaves, grated ginger, salt, turmeric powder, hing, mixed vegetables and 3 cups of water. 7. Mix them well. Pressure cook for 1 whistle in high flame and keep the flame in simmer and cook for 10 more mins. 8. Heat the pan, add ghee and fry the cashew nuts till they become golden color. 9. After pressure has gone, temper the pongal with fried cashew nuts. Mix them well and transfer it into a serving bowl or hot box. Healthy, tasty and yummy varagu veg pongal is ready. Serve it with Coconut Chutney, Tomato Chutney and Sambar. 3. Addition of turmeric powder is optional. Click here for Pongal Recipes. 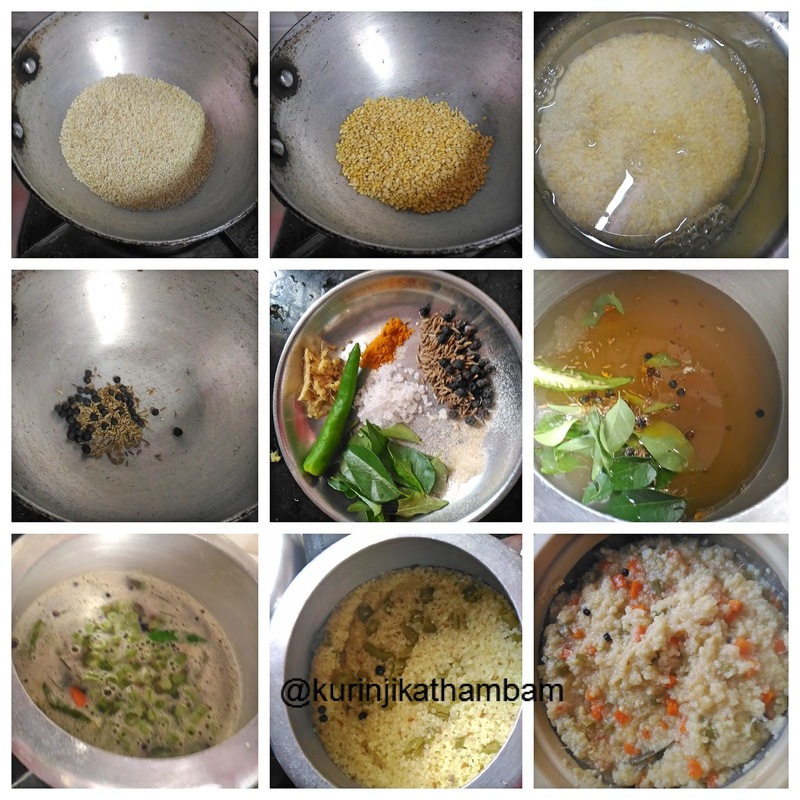 very healthy pongal..your pics are looking awesome! Healthy and tasty recipe. Where you buy the plate😜? The presentation is beautiful!!! !